It's Friday, and it's time for some mid-challenge inspiration at Aloha Friday Challenges. The theme for this challenge is "Birthday". This image is Color Me Garden, colored with Copic markers. The paper behind Color Me Garden, also from We Are 3 Digital Shop, is from Peonies Ballet. 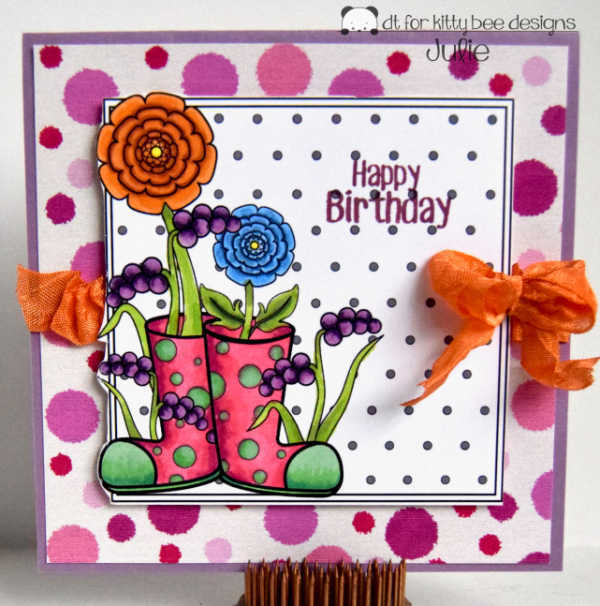 The 'Happy Birthday' sentiment is an acrylic stamp from Craftin' Desert Divas. The orange crinkle ribbon is from 3 Girl JAM -- long retired now, but I'm still well stocked! Birthdays -- we all need cards for them, so get busy creating, then enter the challenge at Aloha Fridays Challenge Blog. You have through Feb. 7 to join us! This is so bright and cheery. It brought a smile to my face. So hope that you have a good weekend. You will need this card. We are supposed to have lots of fog. Absolutely beautiful, Julie! Thank you for creating this card, you are an awesome DT! so lovely and great bright colours! Thanks for joinning us at papercraft-challenges and good luck.